Not yet named; reclaimed La Carte and a new prairie image. Save money and have fun by re-working your Sennelier La Carte paper. Some papers can be reclaimed by pastel artists; new artwork can be made on top of failed images. But, many artists don't consider Sennelier La Carte durable enough to reclaim. To worsen this impression, La Carte is water hating, and so washing off an image isn't considered. This artwork was done on re-claimed Sennelier La Carte paper. I want to introduce you to the many ways you can re-purpose your valuable Sennelier La Carte paper, as I have been doing successfully for the past few months. Additionally, I have achieved new techniques from these methods - rewarding me with fresh ideas and images. With the Great Recession in full pace, I have been searching for ways to save on material costs in the studio. I have been turning to my stock of Rives BFK, Legion and other papers. I have always enjoyed Wallis, which is hands down the most durable sanded paper available. You can wipe, wash and re-use it to your heart's delight. Not so much the sensitive French sanded ground, La Carte. La Carte is a professional, acid-free and colorfast board that has a sanded texture created with vegetable matter. I prefer it for my own methods - it is the surface most suitable for my style of both heavy handed application of color, and also gentle scumbling and overlaying. 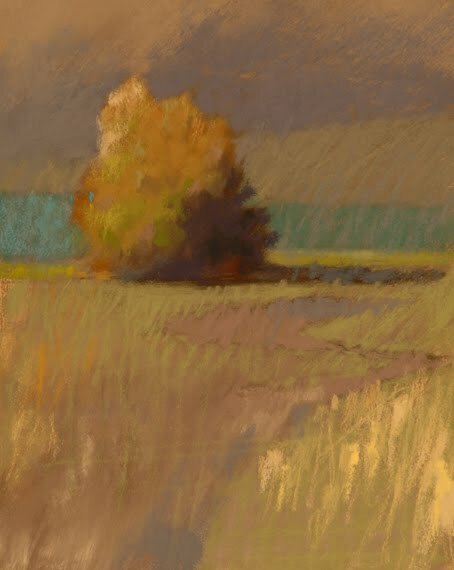 Nothing beats whispering a Diane Townsend Terrage pastel over it's grainy surface, mixing optically with the under layers. Now add the rich pinks and blues from your Sennelier à l'écu sticks and you have advanced to the seventh heaven of artistry. Identify abandoned works that you are going to reclaim. 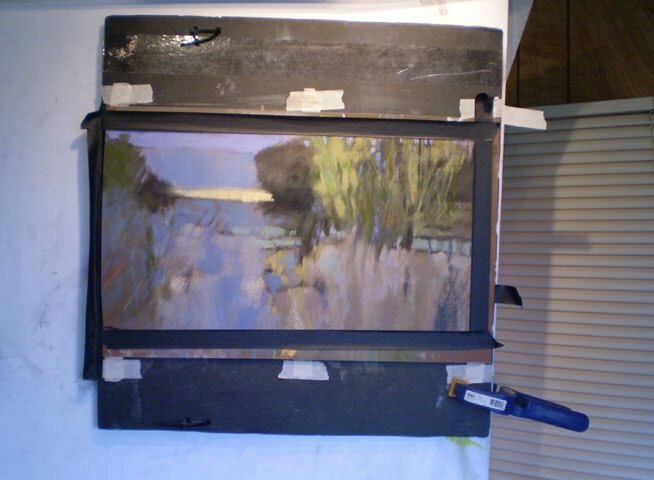 I look for lighter pastel coverage, although I have reused heavily worked surfaces, too. It is just harder to find enough tooth available, but it helps if there is an image there that you can imagine as an under painting - it may become a brilliant foundation for your new art. Read on to learn my tricks for finding more tooth in your used Sennie paper. Brush away the existing pastel dust with a flat brush. A smooth, cheap paint brush works great - I work the surface one direction at a time, and tap the paper to release stuck dust. Repeat this process to see how much you can remove, and you'll soon get an idea of how exciting this method can be. Wipe the old pastel off gently with tissue, a paper towel or a chamois cloth. My favored method is with the tissue, after I have already removed as much as possible with a brush. There will be bits of tissue remaining, and that can easily be brushed away - especially if you were gentle. Wash the old image away, as another option. The proper solvent is Turpenoid, which is low odor, and works fine for under painting and blending your pastel on La Carte. I have had some success with this method, but I do find that it fills the tooth more than the brushing or wiping methods. Still having trouble getting your pastel to take? I have found two more methods to reclaim my cleaned-up old La Carte. Spray the surface with fixative. Right now, my favorite spray is No-Odor Blair, which I can use in the studio with minimum discomfort. I also like Spectrafix, but at the point where I am starting to add pastel to a reclaimed surface, I want the most coverage I can get from my spray. Another method would be to apply several layers of the Spectrafix. For subsequent layers, after my colors have been established, I use Lascaux spray, which changes my colors the least. I don't want to add spray at the end of my work, though, since the highlights need to pop. Sand the surface to bring back just enough texture to accept more pastel. I tried a sandpaper block made of foam, and it actually worked great! The finer side of a two-sided block works, and I have found that it is only needed on small areas and not the whole painting. The conditions will be that you have developed your painting, and will have a nicely resolved artwork, except that a limited area will be dull and resist new marks. Like with the brush, sand in one direction only, to avoid tearing the paper. Now consider some new techniques brought out by reclaiming old La Carte. In many cases, I have created new works that allow old colors to bleed or to show through. Some become vardøgr images, and some provide rich under paintings (red under green in a tree). I have taken to imagining my new image around an old composition, often turning the old painting upside down or sideways. 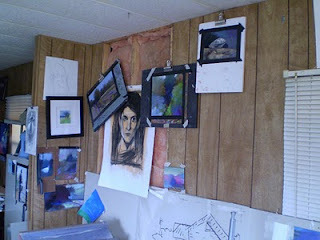 A crowded build-up of art in my studio. I may be handy with supports, but can't get around to putting up that 1 piece of drywall! Any guesses on who I was trying to draw on that big one? Did you sneeze on your La Carte pastel painting? Then you may have run up against the dreaded white hole of melted-off surface that has plagued many Sennelier users. See this post with repair solutions for damaged works (h/t Sheila M. Evans). My images at Sennelier: here. Great post Casey. I have reclaimed a few LaCartes in my history with the brush/tap method followed by a spray of Daler Rowney fixative. As for your studio wall, I have found that covering my studio walls with homosope board that I have a great surface to pin artwork into with ease as it is softer than drywall. Not for permanence and usually applied over drywall - I've used it in my studio spaces going back 20 years or so. Thank you very kindly for reporting, Toodleart. I am off to google that wall board right now! Very interesting Post Casey. Sennelier La Carte is my absolute favourite pastel ground too.To get of the pastel a foam brush can be of good assistance too. I remember that is your favorite. I should have mentioned foam, which I like for moving around pastel. One thing I want to try in the future are foam shapers - both for graphite and pastel. Do you have other methods for reclaiming, Asti - I'd like to hear them. Lovely work! 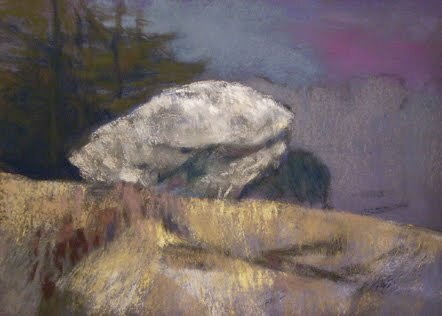 I don't work in pastel very often, so I am very impressed when an artist does with such ease and mastery as you do. I've been dazzled viewing each of your posts recently. The colors are brilliant and the compositions solid. Casey, this is very interesting and useful post. 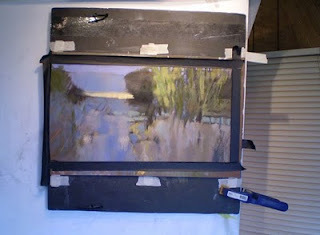 I'll link to it from my blog as a good tip for Soft Pastel Artists. Thanks for doing this!!! Thanks for the comments and for reading, Melinda. Great to meet you. Thanks for the link, Mario. Interesting post Casey. Thanks. It's always good to find ways of saving papers/paintings. Celeste - that's just it, the likeness failed. It is supposed to be from a young Picasso's self portrait.